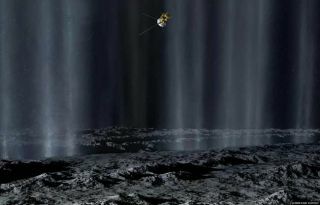 Artist's impression of the Cassini spacecraft making a close pass by Saturn's inner moon Enceladus to study plumes from geysers that erupt from giant fissures in the moon's southern polar region. As Saturn's icy moon Enceladus circles around the ringedgiant, it plows through the charged plasma surrounding the planet, leaving acomplex pattern of ripples and bubbles in its wake. Enceladus sits deep within Saturn's protective magneticcasing, called a magnetosphere, which is filled with electrically chargedparticles (plasma) that originate from both the planet itsmany moons. NASA's Cassini spacecraft has conducted nine flybys of themysterious sixth-largest moon since 2005. The closest of these flybys brought the probe to within just15.5 miles (25 kilometers) of Enceladus's surface, which many scientistsbelieve concealsa saline ocean. Heated vents at the south pole of the moon releasea plume of material, consisting mainly of icy grains and water vapor, intospace. Cassini measurements show that both the moon and its plumeare continuously soaking up the plasma, which rushes past at around 67,000 mph (108,000kilometers per hour), leaving a cavity downstream. In addition, the mostenergetic particles which zoom up and down Saturn's magnetic field lines areswept up, leaving a much larger void in the high energy plasma. Material from Enceladus,both dust and gas, is also being charged and forming new plasma. Cassini scientists have also discovered mysterious spikyfeatures in the plasma wake of Enceladus that present a complex picture ofreadjustment downstream from the icy moon. "Eventually the plasma closes the gap downstream fromEnceladus but our observations show that this isn't happening in a smooth,orderly fashion," said Sheila Kanani of University College London, whohelped discover the odd features. "We are seeing spiky features in theplasma that last between a few tens of seconds and a minute or two. We thinkthat these might represent bubbles of low energy particles formed as the plasmafills the gap from different directions." There are no conventional images of the bubbles, however. Since Cassini arrived at Saturn, it has been building up apicture of the vital and unexpected role that Enceladus plays in Saturn'smagnetosphere. Enceladus may play a role similar to Jupiter's moon Io, whichpumps plasma into Jupiter's environment. A picture of plasma adjustments in thewake of Enceladus could provide clues to how plasma gets transported around theSaturnianenvironment. "Enceladus is the source of most of the plasma inSaturn's magnetosphere, with ionized water and oxygen originating from thevents forming a big torus of plasma that surrounds Saturn. We may see thesespiky features in the wake of Saturn's other moons as they interact with the plasmabut, to date, we have only studied Enceladus in sufficient detail," Kananisaid.